← Will Broadway Brad be headed back to New York this offseason? Keith Yandle, Kevin Klein and Matt Hunwick combined to make up the third pairing for the Rangers throughout the season, each playing a very different role on the team. Photos courtesy of MSG Photos. Rounding out the Rangers defense is the third pairing, which at times, can be just as important as the other two pairings. For Alain Vigneault and New York, that third pairing was constantly changing. This article will evaluate what it looked like at the end of the season, including the extra defenseman. As of March 1st, that last pairing consisted of Keith Yandle and Kevin Klein. Yandle had just come over in a trade with the Arizona Coyotes, and Kevin Klein, playing in his first full season with the Rangers and having one of the best seasons of his career. 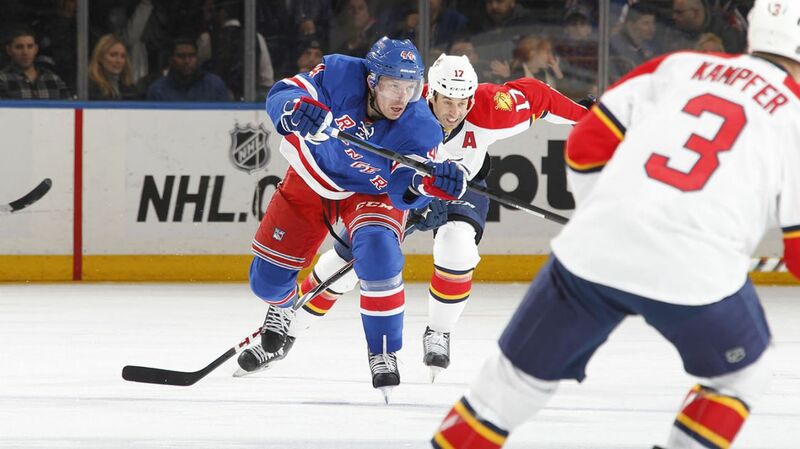 Matt Hunwick, signed in the offseason as the seventh defenseman, wound up playing 55 regular season games, and became a very important player for the Rangers this season. When looking at each of these players, Yandle, Klein and Hunwick are all very different. But each one of them were important to the team in their own way. While the trade for Yandle may have been controversial, he did exactly what was expected of him, and with a full season in New York coming up, Yandle could be the dynamic, puck-moving defenseman the Rangers need. Photo courtesy of MSG Photos. Keith Yandle came to the Rangers in a trade with the Coyotes, with Sather sending top-prospect Anthony Duclair, John Moore, and two picks for the puck-moving defenseman. 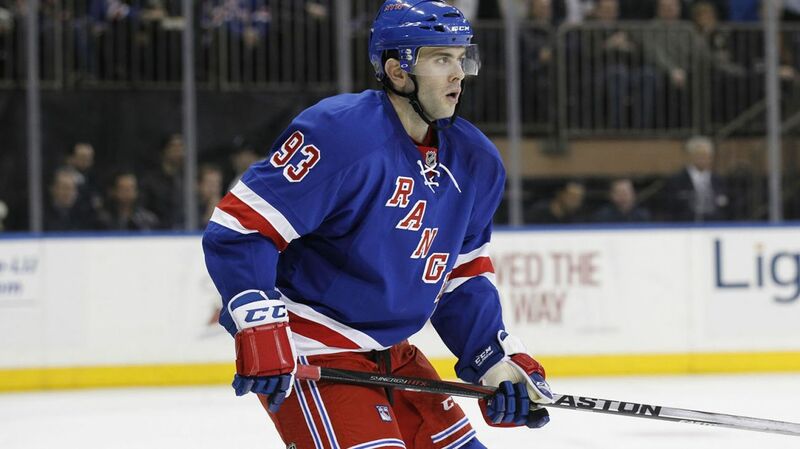 It may prove to be a big risk, but Yandle lived up to expectations in New York. It took a couple of games for him to adjust to the new system and his new teammates, but pretty quickly he was making great outlet passes, moving the puck well and racking up the points. Over his last 12 games with the Rangers during the Regular season, Yandle tallied 10 points (1-9-10), and was really helping generate offense from the blue line. The power play continued to struggle, but Yandle certainly helped it run more smoothly, with quick passing and better scoring chances (Note: I think the power play is more of a problem with the forwards, not the point men). Things really changed for Yandle when he scored his first goal as a member of the Rangers in a win on March 14th against the Sabres, which was also his first point in New York. He got the monkey off of his back, regained confidence and began playing a lot better. Shortly into the playoffs, like many of the other defensemen, Yandle was injured, spraining the AC joint in his shoulder during Game 2 against the Penguins. The injury was a result of a Blake Comeau hit along the boards. That injury definitely had an effect on his play during the first two series, but he still held his own. Yandle tallied four points, all assists, in those first 12 games. Against the Lightning, Yandle said that he felt about 100% during the series against the Lightning, and it showed. Tampa played a very fast, up-tempo style of game, which is exactly the scenario that he thrives in. Yandle was zooming up and down the ice, playing with a bit of an edge, helping on breakout passes through the neutral zone, and tallying seven points (2-5-7) in that series alone. While Yandle may not be the most capable defenseman in his own end, that’s not really the point of his game. He skates up the ice with the puck, helps the Rangers transition into offense, and facilitates shots and scoring chances all over the ice. He also doesn’t really allow the opposition to have the puck all that much, which is a strength. 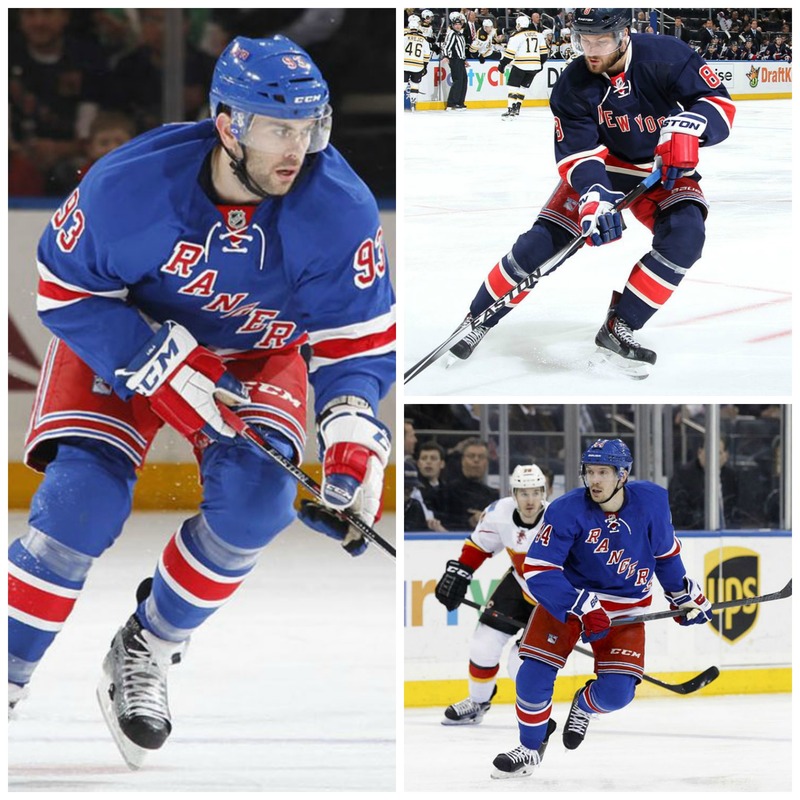 The main point is Yandle is not tasked to be a shut-down defender for the Rangers. He doesn’t face the top talent on opposing teams, and that’s because Vigneault manages his defensemen well. Dan Girardi and Kevin Klein are meant to be the shutdown defenders, as well as McDonagh and Staal, although they have different elements to their game as well. Keith Yandle came to New York and did exactly what he was supposed to, playing well in the playoffs despite a tough shoulder injury. The Rangers will have a potential 50 point defensemen for a full season, a mark that Yandle has reached in each of the past two seasons. Couple that with Ryan McDonagh, who is fully capable of a 40-50 point season himself, and Alain Vigneault has quite the dynamic defensive group for next season. Kevin Klein was having a career season until a broken arm in March threw off his game. Photo courtesy of MSG Photos. Last season, Kevin Klein was acquired in January from the Nashville Predators, with the Rangers looking to add another solid defensive defenseman with an affordable contract. Klein proved to be reliable in his own zone, not breaking the bank and playing well as a fourth defenseman, or on the bottom pairing. 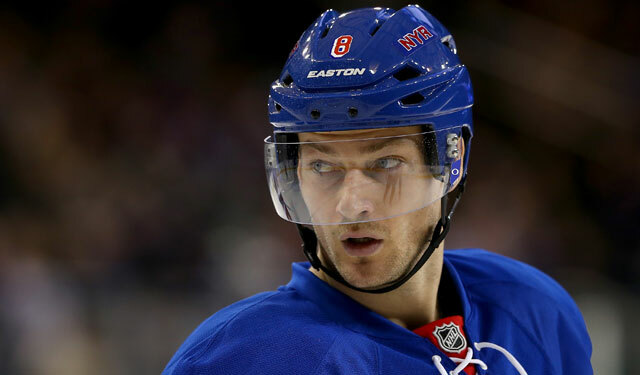 This year, Klein’s first full season with the Rangers, wound up being an offensive revelation for the 30 year old veteran defenseman. After never scoring more than 4 goals in a season, and breaking the 20 point mark just once, Klein found his offensive touch, scoring a career high nine goals and tying his career high in assists (17). He also set a career high in plus/minus, posting a +24 in the regular season. For someone who never really utilized his shot, Klein has a blistering slap shot from the point. Once he learns to place that shot, he could wind up becoming a pretty good scorer. He also came through in the clutch a lot, with four of his nine goals being game winners. That was tied with Carl Hagelin for third on the team. While the offense was certainly a surprise from Klein, his defensive play was just as reliable during the regular season. Despite being a third pair defenseman, Klein can be paired against top talent and still handle his own. He proved to be a very reliable, affordable defenseman during the regular season, and the offense was pure bonus. In a game on March 11th against the Washington Capitals, Klein was hit in the forearm by an Alex Ovechkin wrist shot, which wound up breaking his arm. That ended his regular season, and sidelined him until Game 1 against the Washington Capitals. In the playoffs, Klein was clearly bothered, and not fully recovered, from the arm injury. The offense from his game completely disappeared, having next to no impact outside of his own zone. He posted a 46.5% Corsi rating, and didn’t play as well overall. While some of that may be due to injury, it was still a rough postseason showing from him. In general, Klein had a fabulous regular season cut short by injury, and a mediocre postseason. I think that if he had stayed healthy, it may have been a different story. Unfortunately, we will never know if that’s the case. Matt Hunwick, at first expected to be just a fill-in guy, came into the lineup and delivered when the Rangers needed help the most. Photo courtesy of MSG Photos. When the Rangers signed Matt Hunwick in the offseason, I thought nothing off it. Raphael Diaz was with the Flames, so I figured Hunwick would just be the seventh defenseman, and play every now and then. Little did I know, Matt Hunwick would be one of the more integral parts of holding the Rangers’ defense together? Hunwick wound up playing by Game 2 of the regular season following Dan Boyle’s broken hand. As guys like Ryan McDonagh, Kevin Klein, and Marc Staal all had injuries, whether major or minor, Hunwick was able to step up and fill in very nicely. After a couple of games, Hunwick began stealing playing time away from John Moore, who was slated to be the sixth defenseman. But Hunwick was playing well enough to the point where he began starting over Moore. He was pretty unlucky during the regular season when it came to offense, striking the post a few times, and getting one goal called back when Caw Ward’s mask fell off in a game against the Hurricanes. But he moves the puck relatively well, is responsible defensively, and limits the opponents’ shot attempts. He played well in the five game series against the playoffs, not scoring any points but doing a good job on defense. He played in Game 7 against the Lightning as the seventh dressed defenseman in case McDonagh could not play, but only played about four minutes or so. Hunwick is everything you could want and more in a seventh defenseman. He was always ready to come into the lineup, put up decent stats, played well defensively and could potentially be a sixth defenseman. He is an upcoming free agent, and the Rangers should certainly try and re-sign him for the same role. Posted on June 17, 2015, in In the Crease and tagged Keith Yandle, Keith Yandle injury, Keith Yandle trade, Kevin Klein, Kevin Klein trade, Klein, Madison Square Garden, Matt Hunwick, Matt Hunwick Contract, MSG, New York Rangers, NY Rangers, NYR, Rangers, Rangers Nation, Rangers Player Grades, Rangerstown, Ryan McDonagh, The Garden, Yandle. Bookmark the permalink. Leave a comment.